I bird in Forest Park a lot. You know, in case you haven’t noticed,I figured I would point that out. I’ve seen two life birds there this spring, a Kentucky Warbler, which was a very quick twitch, and a Gray-cheeked Thrush, a bird I have probably seen before but failed to identify. The Kentucky Warbler was one of 26 species of wood-warbler I’ve seen this spring in the park, nearly a quarter of the 106 species I’ve had the pleasure of making an acquaintance with there. How have I seen such a panoply of species? Well, the waterhole is absurd for attracting avians and the pond sometimes holds pleasant surprises. A Green Heron is certainly a nice bird to see, especially one that is more intent on fishing than it is on the birder taking its picture. For that matter, it is kind of hard to be upset when an American Redstart decides he wants to sing perched on a stick directly in front of you. The blotchy young male bird was trying very hard to be as attractive as he will be when he gets his orange-and-black uniform, which won’t be until his second year of life. He was one of three redstarts around the waterhole that day, the other two being an adult male and an adult female, and the three birds spent as much time chasing each other as they did catching bugs. Some early breeding birds have already fledged their first brood: I’ve seen young White-breasted Nuthatches and single just-out-of-the-nest Tufted Titmouse. And don’t even get me started on the European Starlings. Baltimore Orioles have been building their nests and American Robins are feeding their nestlings. 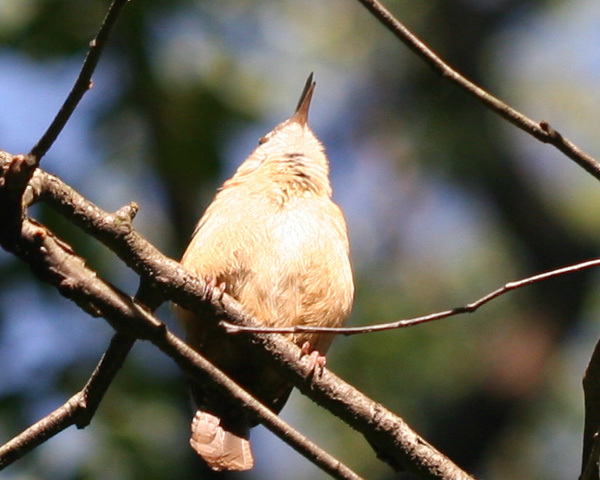 The Carolina Wren singing below is quite clearly on territory where the gully intersects the equestrian trail. Charlie sais he’s “satisfied” with birding in South Africa and now you write you might take some time off birding to do “major city” stuff. What is wrong with you guys, for crying out loud!?!!! What is happening!? Don’t worry, Jochen. Neither of our friends are capable of slowing down, let alone stopping when it comes to birding. Absolutely stunning pictures. I love birds too – it’s amazing I seem to see them where ever I go. Be it in the forests or on a busy avenue. @Jochen: Yeah, Mike is right…last night after work I took the subway to Brooklyn to see Monk Parakeets and then waited around until 9 hoping to see Common Nighthawks which failed to appear. Thanks, Corey, that’s a relief! But of course the Brooklyn Nighthawks won’t show themselves to a Queens birder, right? Corey, you should try the restoration pond in Forest Park at dusk for nighthawks… I actually had one calling on my block (115th St) last week just after dusk. The pond at Kissena Park is also a good place to try for them.